Our November 2006 Newsletter is now available online. A PDF version is also available. SAULT STE. MARIE—The Soo Theatre Project has received an unprecedented windfall in the form of theatre equipment from Jim Wehr, owner and manager of Mackinaw Crossings in Mackinaw City. The gift includes complete lighting and sound systems, stage curtains and drops, theatre seats, sets, costumes, and props, and stage rigging, and is estimated to value in the six-figure range. Dianna George, Soo Theatre Project Board President, called Wehr's donation “overwhelming and a real boost to the end product” that she visualizes for the historic old structure in downtown Sault Ste. Marie when it is restored to its original grandeur. She is still wondering if she just dreamed the whole exciting experience. Soo Theatre Project Board President Dianna George celebrates the transfer of the Mackinaw Crossings Theater equipment donation from Jim Wehr, owner and manager of Mackinaw Crossings (right). Fred Schmidt, Wehr’s operations manager, is on the left. Photo by Meta Geyer. Wehr took this conversation to his life partner, Trish Bradford. Knowing and appreciating the value of live theatre in a community, the couple was soon thinking about the feasibility of an outright donation to show their support for such an undertaking. 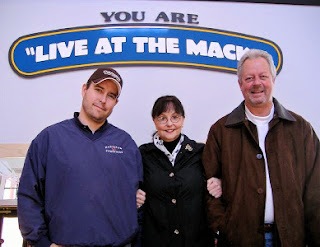 Wehr was back on the phone within days with good news and the process began with the last performance at the Mackinaw Theater on Sunday, October 22, 2006. Wehr described his decision as a win/win situation. “I don’t have time to find a place to store stuff and try to sell it. This is a good deal for me and Soo Theatre.” He also donated sound and lighting equipment to Mackinaw City’s outdoor concert program. Dismantling began on Monday, October 23. Operations manager Fred Schmidt said everything was being labeled and checked to make sure the equipment was working. Soo Theatre Project Board Member and Technical Director Taylor Brugman is coordinating the move of the theatre contents sixty miles north with largely volunteer help. Before they finished loading the first large U-Haul truck, he learned there were pieces too large to fit in a tractor trailer. The logistics of moving the equipment are staggering, but Brugman viewed it as just another challenge to be met. Another problem was where to store things as the Soo Theatre was full of props for the Haunted Theatre held the Friday and Saturday before Halloween. Local businessmen came through with some temporary storage and volunteers worked Sunday to strike the Haunted Theatre sets. Monday the big U-Haul and a tractor trailer load of items were emptied into the theatre. The work will continue for several weeks. The Mackinaw Theater crew carefully dismantled and labeled all of the curtains and drops, lighting and sound equipment, and stage rigging. 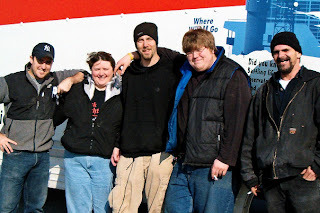 Caught on a rare sunny day during the move were (L-R): Patrick West, sound; Rachel Love, stage manager; Steve Klunder, lighting; and crew members Jake George and Bob Green. Photo by Liz Brugman. Meanwhile, remodeling of the Mackinaw Theater into an outdoor superstore called Mackinaw Outfitters is in full swing. The projected opening date is June 2007. Wehr plans to entertain and educate families about nature and all the wonders of Northern Michigan and the Upper Peninsula. Products from Bass Pro will be featured and outdoor skills workshops for young and old will be offered. A 10,000-gallon aquarium will be stocked with Great Lakes fish and a 40-foot climbing wall with a Mackinac Bridge theme will provide a challenge for the more adventurous visitors. Wehr and his fiancée, Trish Bradford, have a home in Mackinac City and plan to spend most of the year there. They are from Springfield, Missouri.